- Fixes of Eidolon Ares: Skills sounds, skills animations and Eidolon Prayer has been fixed. - New Content: Eidolon 4* Stories. Now you can unlock an extra bonus stat when pairing two 4* eidolons. The bonus given will double 3* stats and become available once the two eidolons paired in your Eidolon Collection Tab have reached level 80, perform your Love Vows through the Ring of Oath and unlocked the 4* buffs. The dungeon will be available once a day from the Nightmare Dungeons Portals at Black Rock Desert. It is a party dungeon and your character must be SLV.1 in order to enter. Inside the dungeon you will find a familiar place but with quite a new challenge. Pair up and play smart in order to survive. - Fight to Nidhogg, Cerberus, Michael, Demeter and others to complete the dungeon. - Inside the dungeon you will be able to get newer eidolons Key Fragments and their accessories. - You will also be granted with amazing loyalty rewards and Nightmare Crests (increases your eidolon stats x5 times than a greater crest) and Nightmare XP Crystals (increases your eidolon exp x10 times than a dazzling crystal). - Complete the last chamber for a chance at Level 80 Eidolon Accessories, Rings of Oaths and Eidolon Reroll Scrolls with the Hidden Treasures. - Not only the last treasures but all Eidolons inside the dungeon will drop Nightmare Coins. - Be careful! Every time you die, you will receive an exp penalty that can only be removed by leveling up. Available for one week, from July 5th to July 12th. The summer breeze that is coming here is trying to force us to live in the outside, breath fresh air and connect with nature... But since who really has the time to go outside, we bring you nature right here to Azuria! On this week's paragon table, you will feel more healthy and loving than ever. - New Heavenly and Hellish Butterfly Wings. - New Golden and Pink Spiritual Feathers. - Idunn, Demeter, Hebe, Freya and Blue Bird Key Fragments. - Blue Bird and Idunn's costume and weapon. - Several kinds of butterfly wings. Promotions will be available for one week, from July 6th to July 13th. 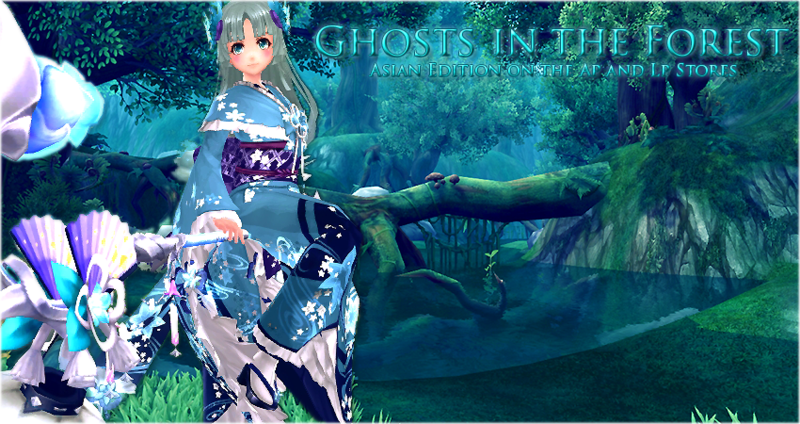 Aoandon Costume and Mount Release in the AP Store: Together with Aoandon's Key of Gaia and Accessory, Murasame and Nikki's Keys of Gaia and Frgments, among other fashion and accessories asian-inspired. Seiryuu's Key of Gaia Release in the LP Store: together with her accessory, Byakko and Vermillion's Keys of Gaia and fragments. Plus, Asian inspired fashion and accessories. During July we will be working on two new exclusive features for the game! On one side, we will be making a full restructuration of our Item Mall, making new eidolon bags available in both stores, packs of consumables with discounts, and brand new items permanently available to our players. We are also working to bring to the game a brand new challenge that will require you to work together: The Monster Hunt. If everything goes as planned, the first challenge will be available starting next month. ty for the updates. any update on panel fix? The problem is that you haven't unlocked the eidolon buffs. And good luck with your nemesis, tho it won't be Kotonoha this time! btw how about the eido lv bug like on this thread : http://forum.aurakingdom.to/showthre...396#post164396 ? anyway thanks for the update !